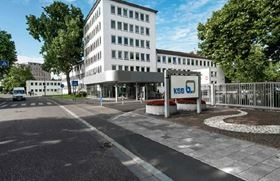 KSB SE & Co KGaA's administration building in Frankenthal, Germany. Copyright: © KSB SE & Co KGaA. Provisional figures for the pump and valve manufacturer KSB show the company delivered increased order intake and sales revenue in 2018. The volume of incoming orders booked by KSB was up €38.2 million to €2304 million in financial year 2018, from 2017’s €2265 million. The 1.7 % increase is primarily attributable to business in the manufacturing sector, in building services, and the re-strengthening of business with liquefied gas valves. About two thirds of the growth in order intake came from Asia and Europe. The companies in North America performed positively, while business in South America before currency effects was weaker. Sales revenue in 2018 was also up 1.7% to €2243.3 million, from €2204.9 million in 2017. As some of the orders are part of long-term projects, sales revenue lags behind order intake. In line with customer planning schedules, major orders – which were again received in greater numbers in 2018 – will only be invoiced by KSB in 2019 and subsequent years. This relates primarily to projects in the Energy and Industry segments.